Brass Kapital trombone commissar Nineteen Nineteen lives in E17. Which means we get to play the ‘Stow Fest. Last year was immense. But this year it’s going to be even bigger. The November Five, staunch comrades but, equally importantly, a superb band whose last album is a constant feature on Kassandra Krossing and Baby Face’s hi-fi, have asked us to join them for a Rock’n’Soul Revue which promises to be the highlight of ‘Stow Fest, and perhaps the highlight of live music in Walthamstow in 2014. 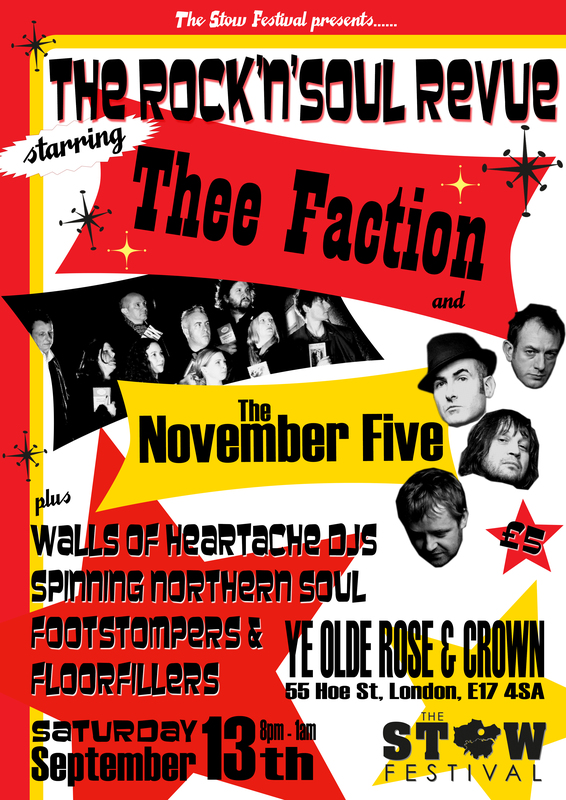 You get two bands at the peak of their powers – we will be playing a Greatest Hits set that will keep your feet tapping and your class consciousness proletarian – but you also get Northern Soul DJs who are straight out of the top drawer. You really need to come to this. You know what’s going to seal the deal? The ticket price. A fiver on the door, comrade. We’ll see you there.